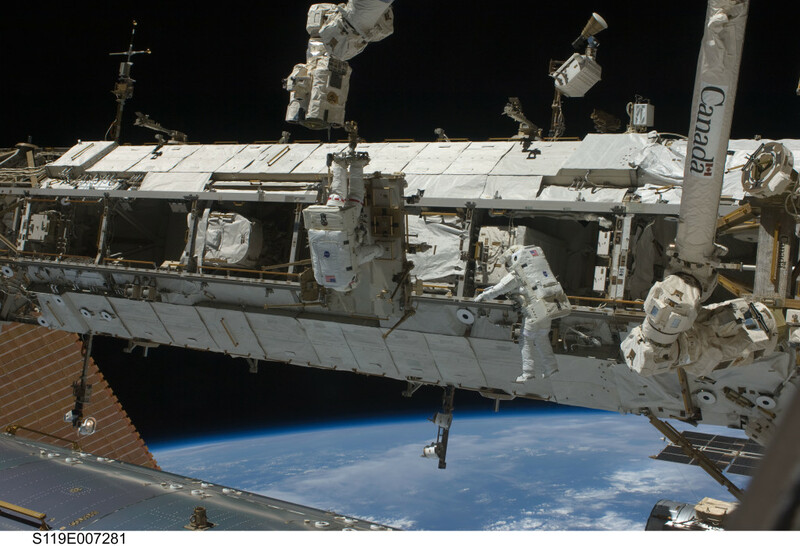 NASA Astronaut Joe Acaba, in the broken red striped spacesuit, and Astronaut Ricky Arnold, in the white striped suit, work to relocate Crew and Equipment Translation Aid (CETA) near the Mobile Transporter (MT) during an STS-119 spacewalk in March 2009. 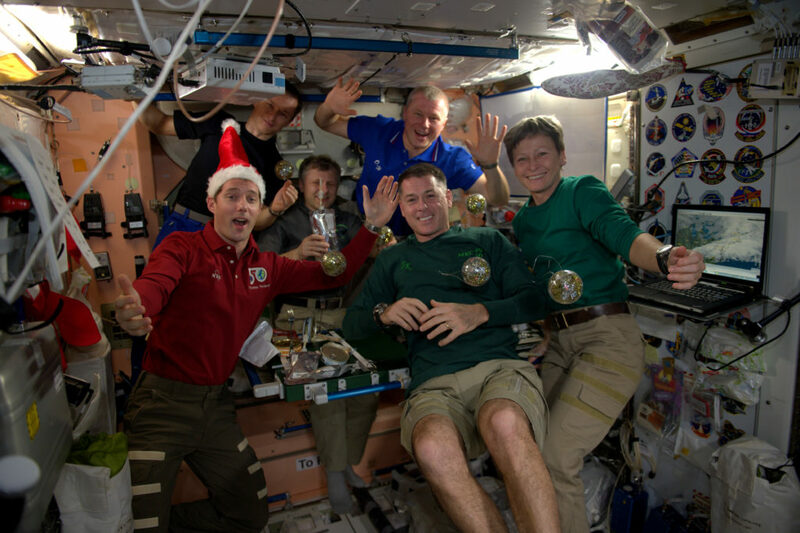 The International Space Station’s mission managers are preparing for a likely unplanned spacewalk by Astronauts Scott Kelly and Tim Kopra no earlier than Monday, Dec. 21. Late Wednesday, the Mobile Transporter rail car on the station’s truss was being moved by robotic flight controllers at Mission Control, Houston, to a different worksite near the center of the truss for payload operations when it stopped moving. The cause of the stall is being evaluated, but experts believe it may be related to a stuck brake handle, said ISS Mission Integration and Operations Manager Kenny Todd. Flight controllers had planned to move the transporter away from the center of the truss to worksite 2. The cause of the stall that halted its movement just four inches (10 centimeters) away from where it began is still being evaluated. Progress 62 is scheduled to launch at 3:44 a.m. EST Monday, and dock on Wednesday to the Pirs docking compartment at 5:31 a.m. Wednesday. The ISS Mission Management Team met Friday morning and is targeting Monday for the spacewalk, but will meet again in a readiness review Sunday morning. Managers could elect to press ahead for Monday, or take an extra day and conduct the spacewalk Tuesday. ISS Expedition 46 Commander Scott Kelly and Flight Engineer Tim Kopra of NASA will conduct the spacewalk. It will be the 191st spacewalk in support of space station assembly and maintenance, the third in Kelly’s career and the second for Kopra. Kelly will be designated Extravehicular Activity crew member 1 (EV1) wearing the suit bearing the red stripes, and Kopra will be Extravehicular Activity crew member 2 (EV2) wearing the suit with no stripes. A start time for the spacewalk either Monday or Tuesday has not yet been set, but NASA TV coverage will begin 90 minutes prior to the start of the spacewalk.